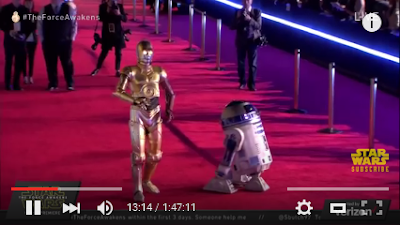 Streamed live on Dec 14, 2015: Watch StarWars.com coverage of the Star Wars: The Force Awakens world premiere red carpet, presented by Verizon and live from Hollywood! Hosts Anthony Carboni, Andi Gutierrez, and David Collins' talk with the cast, creators, and fans. This is a report on all of the action from the movie event of the year. This is allegedly the latest trailer in the series: STAR WARS 7: The Force Awakens FINAL Trailer (2015) Extended NEW FOOTAGE. The exclusive brand new and final Star Wars Episode VII Trailer is here with a variety of epic NEW Footage! Directed by J.J. Abrams. Starring Daisy Ridley, John Boyega, Harrison Ford, Mark Hamill, Carrie Fisher, Oscar Isaac, Simon Pegg. Star Wars: Episode VII - premieres in Hollywood tonight, Dec. 14, 2015. Fans have been standing in line for days. The Force Awakens hits normal theaters Dec., 18 2015.
Who are the lucky fans suffering rare inclement weather in Los Angeles? 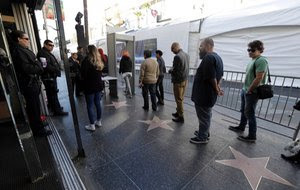 Diehard fans stand in line and go through metal detector for tonight's world premiere (AP).